Who is Sabine's mother in Star Wars Rebels? UPDATE: This article was written before season 3 aired. 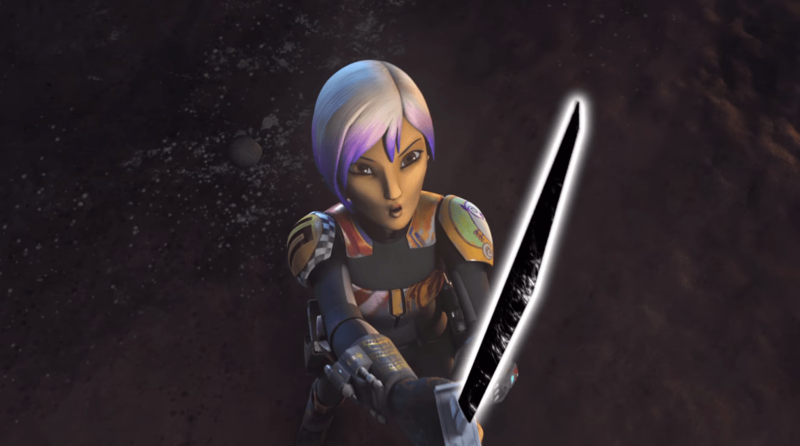 We know now how Sabine obtained the Darksaber. We also learned that Sabine’s mother is an accomplice of Son of Dathomir character Gar Saxon. And that she’s looking for her daughter. All this only further supports this theory, so definitely read on! Rebels season 3 is almost upon us. It will feature lots of holocron goodness, introduce the ancient spiritual entity Bendu, and return fan-favourite character Thrawn to canon. You see, between all those exciting shots of Chiss and Dathomir magick, there were some other standout bits: Mandalorians who serve the Empire, and Sabine holding the weapon of Mandalorian heritage, the Darksaber. Combined with her prominent appearance on the poster, I’d wager it’s safe to say we’ll get to know a lot more about our graffiti-wielding warrior. And one of the questions about her I think we’ll see answered, is: Who is Sabine’s mother? 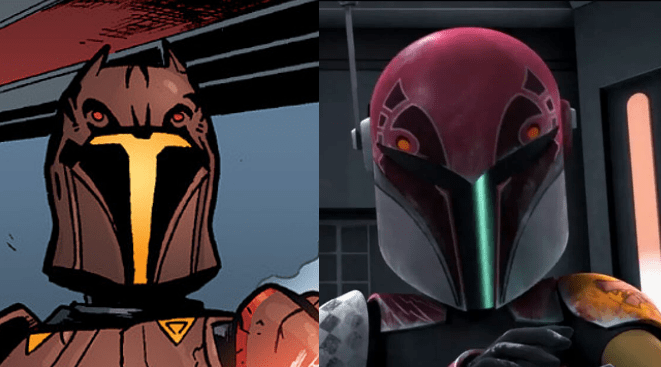 Now, as Dave Filoni told us in a Rebels Recon episode last season, Sabine’s mother was a member of Death Watch who was in the throne room when Maul killed Pre Vizsla. This has made Bo-Katan Kryze a popular candidate, as the only other female Mandalorian we know for sure was in that room. However, there’s multiple masked Mandalorians in that scene with undeniably female features. More importantly, in another interview, Filoni said we shouldn’t assume Sabine to be related to Satine just because of their similar names. I’d like to offer an alternative candidate: Rook Kast. Rook is a character whose first (and so far, only) appearance was in the canon Darth Maul – Son of Dathomir comic. Considering she leads the Mandalorians in Maul’s Shadow Collective, it’s only natural that she would be one of his first Mandalorian supporters. And so it’s not a stretch to assume she was present when Maul killed Pre Viszla, and later Satine Kryze. Then there’s the markings on their helmets.. Do they stand for something important to both of these women? If Kast indeed turns out to be Sabine’s mother, it also adds a lot of conflict between the two women. We know Sabine as a fierce fighter for freedom and justice. Rook, on the other hand, is so compelled by the Mandalorian’s belief in the right of the strongest that she’d follow a Sith Lord to hell and back. This would add a lot more conflict to the show than if Sabine’s mom were to be Bo-Katan, who’s always had at least inklings of good in her. So what do you think? Will Sabine’s mother really be one of Maul’s most staunch supporters? Or am I way off base? Let me know in the comments or on Twitter!